In the era of the smartphone, where technologies like Android and iOS are highly in demand. Small and midsize industries have started to realize that having a website was not enough and how essential it is to have their own mobile applications for their businesses. Right from news feed to e-commerce, social networking to productivity and much more can be developed using mobile application development solutions. We all know that interaction in the world of business plays a vital role has become a must, as companies want to understand the basic needs and problems of their customer. Living in the 21st century, where most of the interaction is not taken place through mobile devices, may it be Android or iOS devices. Thus, developing a mobile application for your business does make sense. Everyone can notice the importance of marketing in the B2C space. Likewise, when every business is transforming its model into mobile applications, significant marketing is also seen in the B2B area. 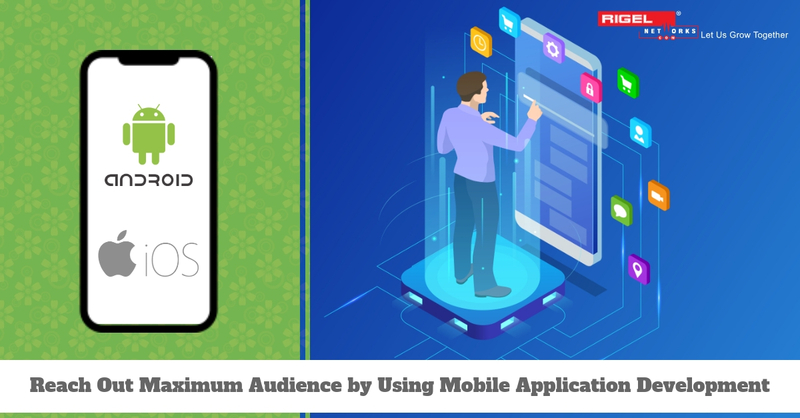 Over the last few years, mobile app developers have been playing a considerable role enabling end users to have access to different services. Also, gain the opportunity to render the same within the tap of their fingertips. Talking about promoting companies enterprise application, B2B marketers need to promote it differently. But then it is essential to realize that it is the best ways to enhance brand value. In addition to this, amidst the youth of today’s generation mobile applications have created an enormous trend such that many people who use smartphones for Internet surfing is increasing at an exponential rate. Why hire mobile application developer from Rigel Networks? In today’s world, social network or apps are the best way to reach out to millions of people across the globe. The interface or apps are not only beneficial for the online business owner, but also for individual owning offline businesses who have started using Social Networks for promoting their business. Rigel Networks – an End to End IT Services Company provides you with a complete solution for designing, developing, launching, and marketing your social application as well as social websites. We aim at creating an amazing mobile application that reaches your defined audience, takes the ideal form for the campaign objective, features the highest level of design quality, and deliver timely results. More importantly, at every step of your project, we ensure to keep you involved in the development process, so you can rest assured that we are building according to your requirements and specifications. Rigel Networks for a successive entrepreneur and innovator, Silicon Valley veteran, business coach and community leader based in California, the USA who owns and operates one of the leading social media marketing websites. The customer instantly promotes its products, share latest deals and services, post news and events, and make new connections with thousands of local customers out there through its website. However, he approached Rigel Networks for a mobile-based solution to reach out maximum audience, as the organization was very well aware that having a site is not enough, due to the rising usage of mobile phones. Looking at the client’s requirement and meet the same, we first identify the optimum solution. Their main demands were a cost-effective solution, fast implementation time, on-going maintenance and support, and high-quality user experience. Within a period of 6 months, Rigel Networks developed a highly scalable, flexible, compatible mobile application on both iOS App Development and Android App Development platforms using technologies like Objective C, Java, tools such as Xcode 5.0, Eclipse, SQLite browser, SQLite 3.0. Database, and iOS SDK 7.0 & Android SDK framework. From this time, the implementation of a mobile solution was beneficial to the client, as they now have a broader customer base. Moreover, within a short span of time, the number of people joining the network had increased by 80% from the mobile channel. Looking at the pace of work and effort put by us, the client was impressed by the way we worked and took care of their mobile application. So are you looking for mobile application developers to design beautiful applications using the latest technologies? Rigel Networks which has certified and experienced mobile app developers that make user-centric enterprise applications to add mobility to your business following simple hiring models. Hurry and cherry-pick the most suitable resource for your company.